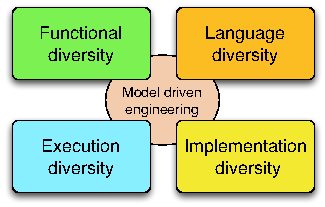 Figure 1 illustrates the four dimensions of software diversity, which form the core research axis of DIVERSE: the diversity of languages used by the stakeholders involved in the construction of these systems; the diversity of features required by the different customers; the diversity of runtime environments in which software has to run and adapt; the diversity of implementations that are necessary for resilience through redundancy. These four axis share and leverage the scientific and technological results developed in the area of model-driven engineering in the last decade. This means that all our research activities are founded on sound abstractions to reason about specific aspects of software systems, compose different perspectives and automatically generate parts of the system. The engineering of systems involves many different stakeholders, each with their own domain of expertise. Hence more and more organizations are adopting Domain Specific Modeling Languages (DSMLs) to allow domain experts to express solutions directly in terms of relevant domain concepts , . This new trend raises new challenges about designing DSMLs, evolving a set of DSMLs and coordinating the use of multiple DSLs for both DSL designers and DSL users. Reusability of software artifacts is a central notion that has been thoroughly studied and used by both academics and industrials since the early days of software construction. Essentially, designing reusable artifacts allows the construction of large systems from smaller parts that have been separately developed and validated, thus reducing the development costs by capitalizing on previous engineering efforts. However, it is still hardly possible for language designers to design typical language artifacts (e.g. language constructs, grammars, editors or compilers) in a reusable way. The current state of the practice usually prevents the reusability of language artifacts from one language to another, consequently hindering the emergence of real engineering techniques around software languages. Conversely, concepts and mechanisms that enable artifacts reusability abound in the software engineering community. Variability in modeling languages occur in the definition of the abstract and concrete syntax as well as in the specification of the language's semantics. The major challenges met when addressing the need for variability are: (i) set principles for modeling language units that support the modular specification of a modeling language; and (ii) design mechanisms to assemble these units in a complete language, according to the set of authorized variation points for the modeling language family. A new generation of complex software-intensive systems (for example smart health support, smart grid, building energy management, and intelligent transportation systems) presents new opportunities for leveraging modeling languages. The development of these systems requires expertise in diverse domains. Consequently, different types of stakeholders (e.g., scientists, engineers and end-users) must work in a coordinated manner on various aspects of the system across multiple development phases. DSMLs can be used to support the work of domain experts who focus on a specific system aspect, but they can also provide the means for coordinating work across teams specializing in different aspects and across development phases. The support and integration of DSMLs leads to what we call the globalization of modeling languages, i.e. the use of multiple languages for the coordinated development of diverse aspects of a system. One can make an analogy with world globalization in which relationships are established between sovereign countries to regulate interactions (e.g., travel and commerce related interactions) while preserving each country's independent existence. We address reuse and variability challenges through the investigation of the time-honored concepts of substitutability, inheritance and components, evaluate their relevance for language designers and provide tools and methods for their inclusion in software language engineering. We will develop novel techniques for the modular construction of language extensions with the support of model syntactical variability. From the semantics perspective, we investigate extension mechanisms for the specification of variability in operational semantics, focusing on static introduction and heterogeneous models of computation. The definition of variation points for the three aspects of the language definition provides the foundations for the novel concept Language Unit (LU) as well as suitable mechanisms to compose such units. We explore the necessary breakthrough in software languages to support modeling and simulation of heterogeneous and open systems. This work relies on the specification of executable domain specific modeling languages (DSMLs) to formalize the various concerns of a software-intensive system, and of models of computation (MoCs) to explicitly model the concurrency, time and communication of such DSMLs. We develop a framework that integrates the necessary foundations and facilities for designing and implementing executable and concurrent domain-specific modeling languages. It also provides unique features to specify composition operators between (possibly heterogeneous) DSMLs. Such specifications are amenable to support the edition, execution, graphical animation and analysis of heterogeneous models. The objective is to provide both a significant improvement of MoCs and DSMLs design and implementation; and the simulation based validation and verification of complex systems. We see an opportunity for the automatic diversification of programs' computation semantics, for example through the diversification of compilers or virtual machines. The main impact of this artificial diversity is to provide flexible computation and thus ease adaptation to different execution conditions. A combination of static and dynamic analysis could support the identification of what we call plastic computation zones in the code. We identify different categories of such zones: (i) areas in the code in which the order of computation can vary (e.g., the order in which a block of sequential statements is executed); (ii) areas that can be removed, keeping the essential functionality  (e.g., skip some loop iterations); (iii) areas that can replaced by alternative code (e.g., replace a try-catch by a return statement). Once we know which zones in the code can be randomized, it is necessary to modify the model of computation to leverage the computation plasticity. This consists in introducing variation points in the interpreter to reflect the diversity of models of computation. Then, the choice of a given variation is performed randomly at run-time. The systematic modeling of variability in software systems has emerged as an effective approach to document and reason about software evolutions and heterogeneity (cf. Section 3.1.2). Variability modeling characterizes an “envelope” of possible software variations. The industrial use of variability models and their relation to software artifact models require a complete engineering framework, including composition, decomposition, analysis, configuration and artifact derivation, refactoring, re-engineering, extraction, and testing. This framework can be used both to tame imposed diversity and to manage chosen diversity. A fundamental problem is that the number of variants can be exponential in the number of options (features). Already with 300 boolean configuration options, approximately 1090 configurations exist – more than estimated count of atoms in the universe. Domains like automotive or operating systems have to manage more than 10000 options (e.g., Linux). Practitioners face the challenge of developing billions of variants. It is easy to forget a necessary constraint, leading to the synthesis of unsafe variants, or to under-approximate the capabilities of the software platform. Scalable modelling techniques are therefore crucial to specify and reason about a very large set of variants. Model-driven development supports two ways to deal with the increasing number of concerns in complex systems: (1) multi-view modeling, i.e. when modeling each concern separately, and variability modeling. However, there is little support to combine both approaches consistently. Techniques to integrate both approaches will enable the construction of a consistent set of views and variation points in each view. The design, construction and maintenance of software families have a major impact on software testing. Among the existing challenges, we can cite: the selection of test cases for a specific variant; the evolution of test suites with integration of new variants; the combinatorial explosion of the number of software configurations to be tested. Novel model-based techniques for test generation and test management in a software product line context are needed to overcome state-of-the-art limits we already observed in some projects. We aim at developing scalable techniques to automatically analyze variability models and their interactions with other views on the software intensive system (requirements, architecture, design). These techniques provide two major advancements in the state of the art: (1) an extension of the semantics of variability models in order to enable the definition of attributes (e.g., cost, quality of service, effort) on features and to include these attributes in the reasoning; (2) an assessment of the consistent specification of variability models with respect to system views (since variability is orthogonal to system modeling, it is currently possible to specify the different models in ways that are semantically meaningless). The former aspect of analysis is tackled through constraint solving and finite-domain constraint programming, while the latter aspect is investigated through automatic search-based techniques (similar to genetic algorithms) for the exploration of the space of interaction between variability and view models. We aim to develop procedures to reverse engineer dependencies and features' sets from existing software artefacts – be it source code, configuration files, spreadsheets (e.g., product comparison matrices) or requirements. We expect to scale up (e.g., for extracting a very large number of variation points) and guarantee some properties (e.g., soundness of configuration semantics, understandability of ontological semantics). For instance, when building complex software-intensive systems, textual requirements are captured in very large quantities of documents. In this context, adequate models to formalize the organization of requirements documents and automated techniques to support impact analysis (in case of changes in the requirements) have to be developed. We aim at developing sound methods and tools to integrate variability management in model-based testing activities. In particular, we will leverage requirement models as an essential asset to establish formal relations between variation points and test models. These relations will form the basis for novel algorithms that drive the systematic selection of test configurations that satisfy well-defined test adequacy criteria as well as the generation of test cases for a specific product in the product line. Flexible yet dependable systems have to cope with heterogeneous hardware execution platforms ranging from smart sensors to huge computation infrastructures and data centers. Evolutions range from a mere change in the system configuration to a major architectural redesign, for instance to support addition of new features or a change in the platform architecture (new hardware is made available, a running system switches to low bandwidth wireless communication, a computation node battery is running low, etc). In this context, we need to devise formalisms to reason about the impact of an evolution and about the transition from one configuration to another. It must be noted that this axis focuses on the use of models to drive the evolution from design time to run-time. Models will be used to (i) systematically define predictable configurations and variation points through which the system will evolve; (ii) develop behaviors necessary to handle unpredicted evolutions. The main challenge is to provide new homogeneous architectural modelling languages and efficient techniques that enable continuous software reconfiguration to react to changes. This work handles the challenges of handling the diversity of runtime infrastructures and managing the cooperation between different stakeholders. More specifically, the research developed in this axis targets the following dimensions of software diversity. Platform architectural heterogeneity induces a first dimension of imposed diversity (type diversity). Platform reconfigurations driven by changing resources define another dimension of diversity (deployment diversity). To deal with these imposed diversity problems, we will rely on model based runtime support for adaptation, in the spirit of the dynamic distributed component framework developed by the Triskell team. Since the runtime environment composed of distributed, resource constrained hardware nodes cannot afford the overhead of traditional runtime adaptation techniques, we investigate the design of novel solutions relying on models@runtime and on specialized tiny virtual machines to offer resource provisioning and dynamic reconfigurations. In the next two years this research will be supported by the InfraJVM project. Diversity can also be an asset to optimize software architecture. Architecture models must integrate multiple concerns in order to properly manage the deployment of software components over a physical platform. However, these concerns can contradict each other (e.g., accuracy and energy). In this context, we investigate automatic solutions to explore the set of possible architecture models and to establish valid trade-offs between all concerns in case of changes. Automatic synthesis of optimal software architectures. Implementing a service over a distributed platform (e.g., a pervasive system or a cloud platform) consists in deploying multiple software components over distributed computation nodes. We aim at designing search-based solutions to (i) assist the software architect in establishing a good initial architecture (that balances between different factors such as cost of the nodes, latency, fault tolerance) and to automatically update the architecture when the environment or the system itself change. The choice of search-based techniques is motivated by the very large number of possible software deployment architectures that can be investigated and that all provide different trade-offs between qualitative factors. Another essential aspect that is supported by multi-objective search is to explore different architectural solutions that are not necessarily comparable. This is important when the qualitative factors are orthogonal to each other, such as security and usability for example. Flexible software architecture for testing and data management. As the number of platforms on which software runs increases and different software versions coexist, the demand for testing environments also increases. For example, to test a software patch or upgrade, the number of testing environments is the product of the number of running environments the software supports and the number of coexisting versions of the software. Based on our first experiment on the synthesis of cloud environment using architectural models, our objective is to define a set of domain specific languages to catch the requirement and to design cloud environments for testing and data management of future internet systems from data centers to things. These languages will be interpreted to support dynamic synthesis and reconfiguration of a testing environment. Runtime support for heterogeneous environments. Execution environments must provide a way to account or reserve resources for applications. However, current execution environments such as the Java Virtual Machine do not clearly define a notion of application: each framework has its own definition. For example, in OSGi, an application is a component, in JEE, an application is most of the time associated to a class loader, in the Multi-Tasking Virtual machine, an application is a process. The challenge consists in defining an execution environment that provides direct control over resources (CPU, Memory, Network I/O) independently from the definition of an application. We propose to define abstract resource containers to account and reserve resources on a distributed network of heterogeneous devices. Open software-intensive systems have to evolve over their lifetime in response to changes in their environment. Yet, most verification techniques assume a closed environment or the ability to predict all changes. Dynamic changes and evolutions thus represent a major challenge for these techniques that aim at assessing the correctness and robustness of the system. On the one hand, DIVERSE will adapt V&V techniques to handle diversity imposed by the requirements and the execution environment, on the other hand we leverage diversity to increase the robustness of software in face of unpredicted situations. More specifically, we address the following V&V challenges. One major challenge to build flexible and open yet dependable systems is that current software engineering techniques require architects to foresee all possible situations the system will have to face. However, openness and flexibility also mean unpredictability: unpredictable bugs, attacks, environmental evolutions, etc. Current fault-tolerance  and security  techniques provide software systems with the capacity of detecting accidental and deliberate faults. However, existing solutions assume that the set of bugs or vulnerabilities in a system does not evolve. This assumption does not hold for open systems, thus it is essential to revisit fault-tolerance and security solutions to account for diverse and unpredictable faults. Diversity is known to be a major asset for the robustness of large, open, and complex systems (e.g., economical or ecological systems). Following this observation, the software engineering literature provides a rich set of work that choose to implement diversity in software systems in order to improve robustness to attacks or to changes in quality of service. These works range from N-version programming to obfuscation of data structures or control flow, to randomization of instruction sets. An essential remaining challenge is to support the automatic synthesis and evolution of software diversity in open software-intensive systems. There is an opportunity to further enhance these techniques in order to cope with a wider diversity of faults, by multiplying the levels of diversity in the different software layers that are found in software-intensive systems (system, libraries, frameworks, application). This increased diversity must be based on artificial program transformations and code synthesis, which increase the chances of exploring novel solutions, better fitted at one point in time. The biological analogy also indicates that diversity should emerge as a side-effect of evolution, to prevent over-specialization towards one kind of diversity. The main objective is to address one of the main limitations of N-version programming for fault-tolerant systems: the manual production and management of software diversity. Through automated injection of artificial diversity we aim at systematically increasing failure diversity and thus increasing the chances of early error detection at run-time. A fundamental assumption for this work is that software-intensive systems can be “good enough” , . Proactive program diversification. We aim at establishing novel principles and techniques that favor the emergence of multiple forms of software diversity in software-intensive systems, in conjunction with the software adaptation mechanisms that leverage this diversity. The main expected outcome is a set of meta-design principles that maintain diversity in systems and the experimental demonstration of the effects of software diversity on the adaptive capacities of CASs. Higher levels of diversity in the system provide a pool of software solutions that can eventually be used to adapt to situations unforeseen at design time (bugs, crash, attacks, etc.). Principles of automated software diversification rely on the automated synthesis of variants in a software product line, as well as finer-grained program synthesis combining unsound transformations and genetic programming to explore the space of mutational robustness. Multi-tier software diversification. We call multi-tier diversification the fact of diversifying several application software components simultaneously. The novelty of our proposal, with respect to the software diversity state of the art, is to diversify the application-level code (for example, diversify the business logics of the application), focusing on the technical layers found in web applications. The diversification of application software code is expected to provide a diversity of failures and vulnerabilities in web server deployment. Web server deployment usually adopts a form of the Reactor architecture pattern, for scalability purposes: multiple copies of the server software stack, called request handlers, are deployed behind a load balancer. This architecture is very favorable for diversification, since by using the multiplicity of request handlers running in a web server we can simultaneously deploy multiple combinations of diverse software components. Then, if one handler is hacked or crashes the others should still be able to process client requests.